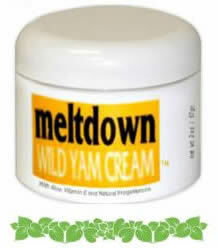 I’ve never had a hot flash since I started using my Meltdown wild yam cream to cure my disabling PMS during my menstruating years. The yam cream allowed me to skip that part of menopause entirely. However, my customers tell me it’s horribly embarrassing and as well as amazingly uncomfortable. Of course, my suggestion is to use my wild yam cream (properly) and get back into biobalance by cutting out all foods rich in copper and eating more comestibles high in zinc. But is wild yam cream safe????? A new study (October 2012) conducted by Brigham and Women’s Hospital in Boston found using low-dose hormone treatment early in menopause relieved hot flashes and the other dreaded symptoms of menopause AND did NOT raise heart risks. The trial studied 700 women and lasted four years. I was the guinea pig when I was creating my cream in 1993 and I’m still here and healthy. But it’s good to know a study conducted by a Harvard-affiliated hospital agrees with me! This entry was posted in Uncategorized and tagged Hot Flashes by admin. Bookmark the permalink.